From a gala dine-around at California Grill high atop Disney’s Contemporary Resort to celebrations around World Showcase at Epcot® and waterfront at Narcoossee’s at Disney’s Grand Floridian Resort & Spa, there are lots of ways for you to ring in the New Year at Walt Disney World® Resort. 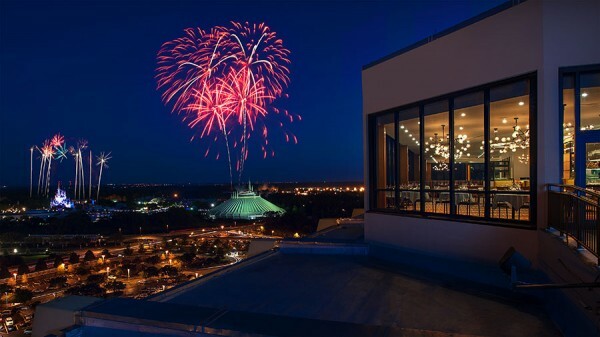 California Grill New Year’s Eve Dinner – With spectacular views of the Magic Kingdom® Park, this dine-around style gala features cooking stations throughout the restaurant. Plus, a host of favorite Disney Characters will make appearances. Monsieur Paul New Year’s Eve Dinner – In the elegant upstairs dining room at the France pavilion at Epcot, your can feast on a four-course, prix fixe menu of classical French cuisine. Six seatings are available on New Year’s Eve: 11:45 a.m., Noon, 2:15 p.m., 2:45 p.m., 5:45 p.m. and 6:15 p.m. The price is $110.81. Plus, a special late-night dinner with two seatings are available at 8:45p.m. and 9:45p.m. The price is $305.03. This entry was posted on November 10, 2016 at 4:33 pm and is filed under Disney Dining, Disney News, Disney Vacation Planning, Special Events, Walt Disney World. You can follow any responses to this entry through the RSS 2.0 feed. You can leave a response or trackback from your own site.